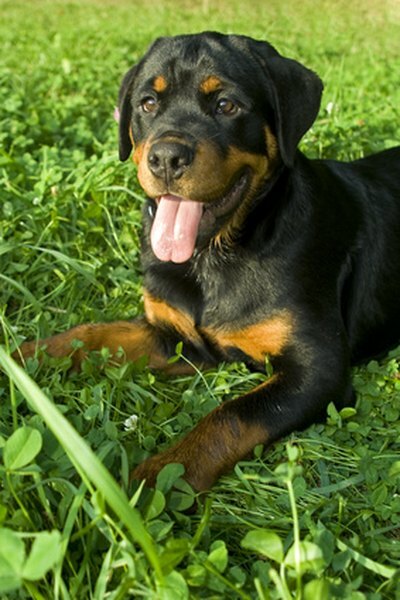 Rottweilers are more vulnerable to developing arthritis than smaller dogs. As they get older, their large and muscular bodies make rottweilers more susceptible to arthritis than their smaller counterparts. Luckily, however, proactive pet parents can take some steps to help prevent arthritis in their beloved rottweilers. Manage your rottweiler’s weight. The ideal weight for a typical rottweiler ranges from 75 to 110 pounds. Feed your dog a balanced, nutritious diet that will help to keep his weight within the optimal range. Excess weight puts additional strain on joints, which can lead to the development of arthritis. If your dog weighs more than 110 pounds, talk to your vet about placing him on a calorie-restricted diet to help him lose weight and reduce the risk of developing arthritis. Keep your rottweiler active. Encouraging your rottweiler to exercise is a crucial step in preventing canine arthritis. Teach your dog to perform muscle-building exercises like swimming or walking on treadmills and have him engage in those exercises regularly throughout his life. Exercise can help your rottweiler keep a good range of motion in his joints and promote healthy weight management. Massage your rottweiler. It may sound funny, but using your fingertips to rub the muscles around your dog’s joints can help relax his muscles and promote a healthy range of motion in his joints, which can help prevent the development of arthritis. Ask your vet or another animal expert to teach you some of the massage and physical therapy techniques that you can use to help prevent arthritis in your dog. Make sure your rottweiler’s bed is comfortable and offers strong joint support. Dogs who sleep in awkward positions are more likely to develop arthritis than dogs who sleep comfortably in beds with good support. Orthopedic dog beds can enhance your dog’s comfort and help prevent the development of arthritis. Add joint-supporting supplements to your rottweiler’s diet. Supplemental vitamins and minerals such as glucosamine and chondroitin can improve joint function in your dog and help minimize the risk of arthritis. Not all dog exercises are created equally. Encourage your rottweiler to swim and walk regularly but avoid having him engage in exercises that could lead to joint pain such as playing Frisbee or other exercises that require a lot of jumping around. If you suspect that your dog may already be suffering from arthritis, take him to a vet for a full health screening and diagnosis. While arthritis caused by degenerative joint disease cannot be entirely avoided, the steps outlined above can help to delay the onset of the disease and can also help to alleviate some of the symptoms.